How often have we all grumbled that a meal out now costs the same as a small car? Well, if you’d like to go back to the good old days of reasonably priced dishes, you won’t want to miss Moshi Moshi rolling back the clock. 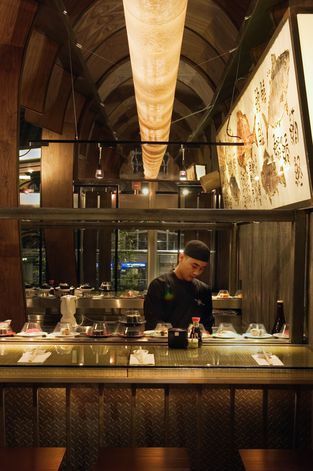 London’s original kaiten (conveyor belt) restaurant in Liverpool Street Station will celebrate its 20th anniversary on Monday 28 July, when it will charge 1994 prices – 90p-£2.50 for dishes at its sushi counter. On 31 July, diners have the chance to win dinner for two by composing a haiku, and on 1 August, some of the dishes will contain ‘Golden Tickets’ which will entitle a few lucky diners to prizes. News 20 years, kaiten, Liverpool Street, Liverpool Street Station, London restaurant, Moshi Moshi, special offer, sushi. permalink.